I used for the coating different shades of foundation. A lighter one all over and a darker one, for the sides of my face sweeping towards my lips and some on the bridge of my nose. I drew a thin line, with a brown eye liner (from the top of my nose) that circled into a awkward looking semi circle. (to my mouth) Which done on both sides, looks like an upside down heart. 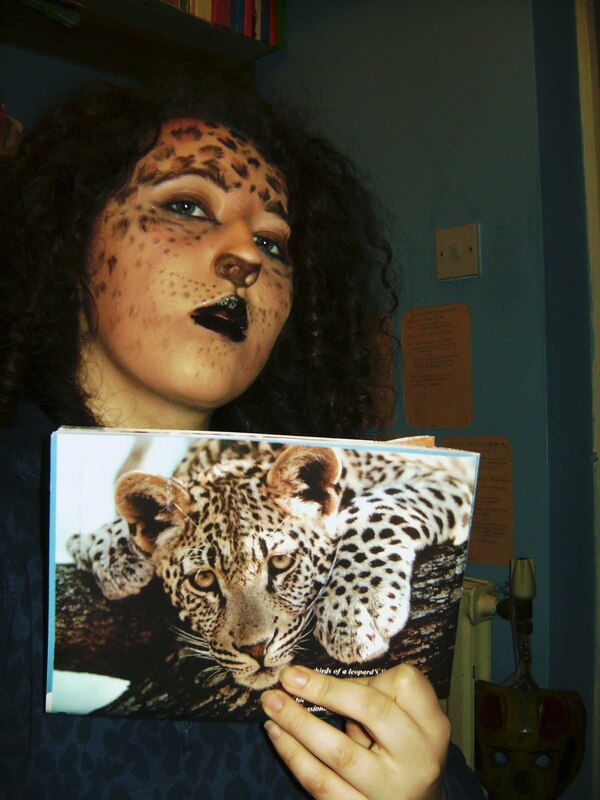 (think about a leopard and look at the picture, to get what I'm talking about) Then used the foundation to blend it in. Then I used the black eyeliner to do cat eyes, think of Amy Winehouse she does dramatic cat eyes. Put eye shadow on, a Goldy/brown colour. Then with the same liner, spotted a few rows for whiskers. 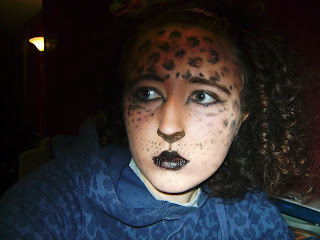 After I used brown eyeshadow to make spots on my forehead and cheeks, outlining half of it with eye liner to get the marking.